If all in life was easy would we give up trying? The rising cost of living as with most of the world is impacting again on the people of Ethiopia. In Addis Ababa we saw many new buildings yet still many poor. Bahir Dar town has several new hotels as it tries to capture more tourists, and you would have thought more chance of employment. Yet the poor we come across are still struggling to make it through day by day. It still fails to amaze us how this struggle is always with a smile and the look of hope. This is the ninth Newsletter highlighting our recent trip to Bahir Dar Ethiopia, as with previous years our friend Jane came along helping the needy and the poor. The amount of luggage we take each year is always a wonder and the thought is, will it all get there? For the first time in 10 years it didn’t - we checked the 6 bags (192kg) in at Addis Ababa for the flight to Bahir Dar. When we arrived at Bahir Dar the bags had not make it. However, as with most things in Ethiopia, it was not perceived as a problem. When reported to the Ethiopian Airlines office they had already received an email stating that the bags would be on the first flight in the morning and in the office in the town at 10.00. We arrived at 10.30 and there they were. 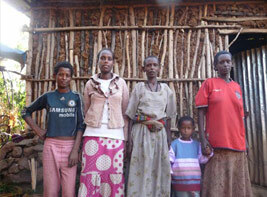 In the ten years that we have been going to Bahir Dar we have seen vast changes to many people’s lives. Many are now self-sufficient and many children have a better future due to getting regular food and an education. Many thanks to all of you who continue to support the people of Bahir Dar.